As most Hampton Roads theater patrons know, Virginia Stage Company’s long-running production of A Christmas Carol is considered a holiday tradition that families must partake in—every, single, holiday season. 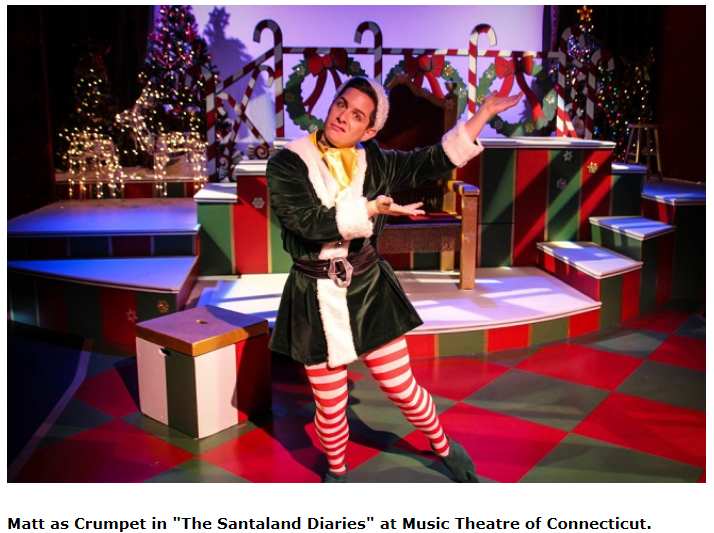 Well this year, VSC is also producing a largely different holiday show for this busy season, one that is specifically targeted at adults only, The Santaland Diaries. It’s the one-man show based on David Sedaris’ famous collection of stories about his stint working as an elf at Macy’s Santaland. 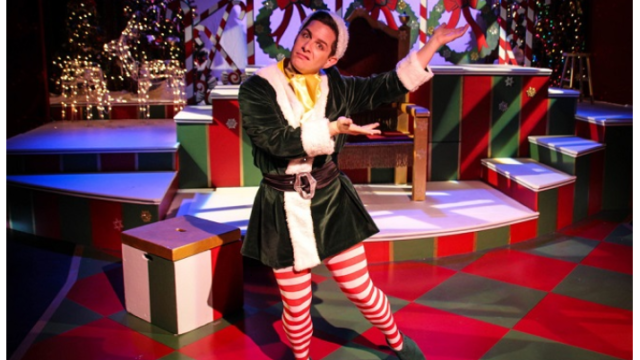 New York actor Matt Densky portrays Crumpet the elf, a role that he played a couple of years back at Music Theatre of Connecticut. When I reach him by phone, just a few days prior to his arrival in VA to start rehearsals, the Connecticut native is walking around a NYC Target, trying to do a bit of Christmas shopping, amongst screaming kids and their frazzled parents. It clearly makes good source material for this challenging, comedic role. “It’s a beast of a show, as an actor,” Matt says. “I’ve spent the past couple of weeks looking like a crazy person, walking up and down the streets of New York, reciting it to myself.” The approximately 90-minute, one-act play is being directed here at VSC, by its producing artistic director, Tom Quaintance. The work requires the actor to not only embody the character of Crumpet the elf, but also voice all of the characters that he comes in contact with while working at Macy’s Santaland. Considered one of New York City’s iconic retail related holiday traditions, Macy’s department store’s annual Santaland, at its Herald Square, 34th street midtown location, is a 13,000 square-foot holiday display, that is an indoor landscape meant to represent the North Pole, where Santa of course lives and works. It has famously been chronicled in a number of Hollywood movies, yet it had never been explored in the way that humorist David Sedaris wrote about it back in the nineties. First reading the essay on an NPR program, the comedic story of the writer’s time working as a Santaland elf at Macy’s, really launched his career. It was eventually included in published books of his, as well as being adapted for the stage by Joe Mantello, as The Santaland Diaries. The first production of the one-man show premiered in November 1996, at the Atlantic Theater Company in New York City. “It’s frickin’ hilarious,” says Matt, early on, about the show. “Definitely Santaland is a sardonic, kind of look at the holiday season.” This is Matt’s first show at VSC, but not his first show in Hampton Roads. He’s performed in a couple of Virginia Musical Theatre productions, including the role of Jimmy Winter in Nice Work If You Can Get It. He’s also performed in a number of high profile holiday productions in New York City, including as Young Max in How the Grinch Stole Christmas!, presented at Madison Square Garden. Apparently, acting was a corrective tool that his mom smartly introduced into Matt’s life at a very young age. The Santaland Diaries is being presented by Virginia Stage Company in a short, two-weekend run, with four of the five dates starting late in the evening. The late start in part insures that the show draws adult patrons looking for something grown up to take in, or get into, during this family-centered holiday season. Matt tells me that during his previous production of the show, some parents actually brought in their children, who may have been in their pre-teens. Apparently in that production, there was an earlier start time for the shows. As the out of work actor who is forced to portray an elf at Macy’s Santaland, the character uses some strong language, and makes observations intended for adult ears. “It’s like a giant diary entry for him, going in chronological order,” Matt says. While preparing for the role at Music Theatre of Connecticut, Matt actually attended Santaland, at the 34th Street Macy’s. “It was maybe not as crazy as the show portrays it to be, but it was pretty nuts,” he says. Parents are clearly passionate about their kids having the opportunity to meet Santa, and take a picture with him. The play pokes fun at the holiday madness that the environment can often create.